The de-constructing fun continued today at our latest Take Apart Table! 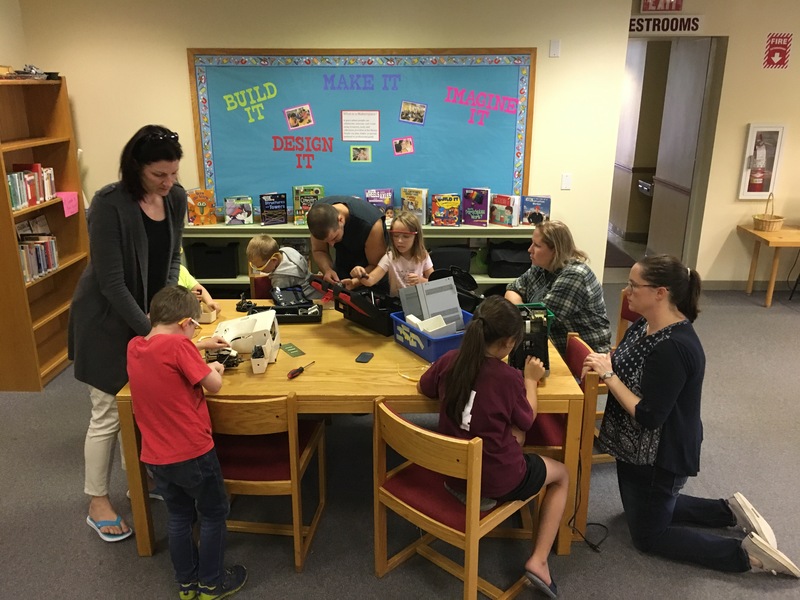 One family stayed for the entire session to finish taking apart the Keurig machine as well as take apart a clock and a wireless speaker. Another group stopped in to continue to take apart our trust sewing machine. Our youngest participants are intrigued by the gears inside the sewing machine and are determined to finish dismantling the sewing machine in our next session. All pieces taken apart will be “up-cycled” in the summer to create a new machine. Anyone have any ideas what we could build? A robot librarian? An automatic book reading robot?? 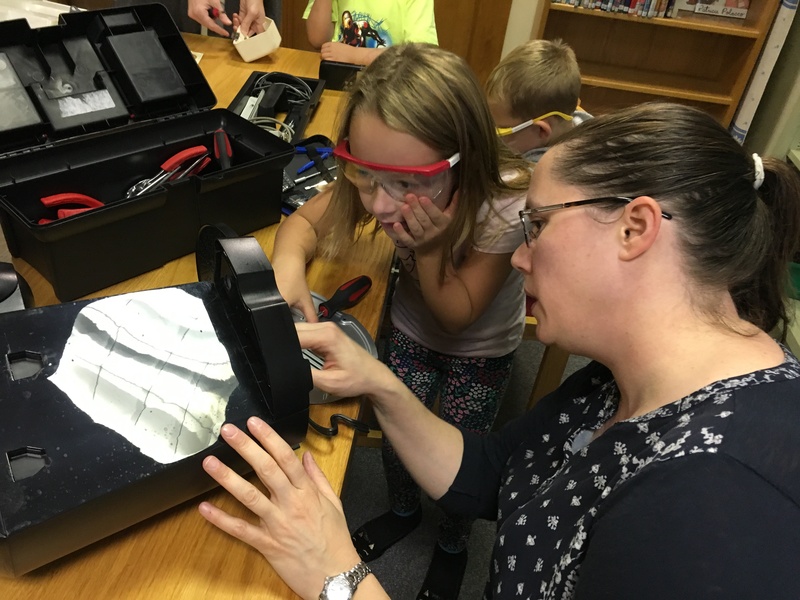 After the success of our first Little Bits workshop, students built on the skills that they learned in the first class to create prototypes of small self-driving vehicles as well as several additional inventions. One student designed a robotic platform base that had a throwing arm attached to it. Once a drinking cup was added to the arm that swings, the student created a game that involved catching a ball in the cup. The principals of engineering and physics were demonstrated at this hands-on workshop. Students had to experiment with a variety of everyday household items (cups, cardboard boxes, tubes) in order to solve some basic engineering problems that pertain to concepts of structure, motion and stability. Today’s program, hosted by Jessica Lamarre, used both the WBPL’s Little Bits Student sets, as well as the Little Bits Coding Kit, to show our program attendees how to use the most popular component pieces including power bits, buzzers, slider dimmers and temperature sensors to create easy machines. The Little Bit elements can run off of batteries or be connected to a laptop. 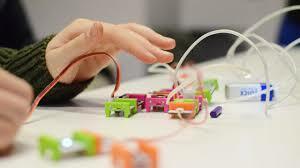 Children also used motion triggers, DC motors and fans as well as transmitters with the aid of a coding program that allowed them to turn any object into a musical instrument. Our early Elementary group built parachutes and explored the concepts of velocity, gravity, motion, friction and acceleration. The presenter from the Easton Children’s Museum demonstrated all of the concepts by using her working model of a helicopter and several parachutes followed by instruction. The students also tested drag, lift and thrust while learning the science behind flying machines. We had an amazing time de-constructing items that were found in our everyday world to see what’s inside! One group tried their hand at a retired sewing machine from our collection and found out how gears work. Another group wanted to see what made a Keurig create delicious cups of coffee. One friend even completely dismantled a small stereo all by herself! All of the items that are taken apart were generously donated by staff and patrons. The items used today were a cross section of skill level required in taking the items apart. Participants ranged in ages from Kindergarten to middle school. All adult guardians of the participants also let a hand in dismantling the items. What a great way to initiate a discussion about how technology is at work in our everyday lives!